Ludwig van Beethoven wrote three wills. The first, the famous Heiligenstadt Testament, was written in 1802 and was found among his papers after the composer's death. Although it is basically a letter, it meets all legal requirements of a will and would have been accepted as valid by any court of law. The second will was a letter (No. 1606 in the complete edition) written on 6 March 1823 to his lawyer Dr. Johann Baptist Bach, in which Beethoven appointed his nephew Karl sole heir and Dr. Bach curator of his estate. Quote: "Death might come without asking [...]" and "[...] you are entitled to choose a guardian for Carl with the exception of my brother Johann van Beethoven". This letter, which was once owned by Albert Cohn in Berlin and today is part of a private collection in the Netherlands, was first published by Emerich Kastner in 1910. 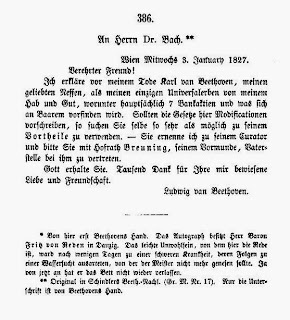 On 3 January 1827, after Beethoven had returned sick from the countryside, he wrote a third will, also in the form of a letter to Dr. Bach (No. 2246 in the complete edition). The fourth disposition concerning his estate, bearing Beethoven's last signature, is just a short codicil, written on 23 March 1827, when the composer was lying on his deathbed and could barely write. 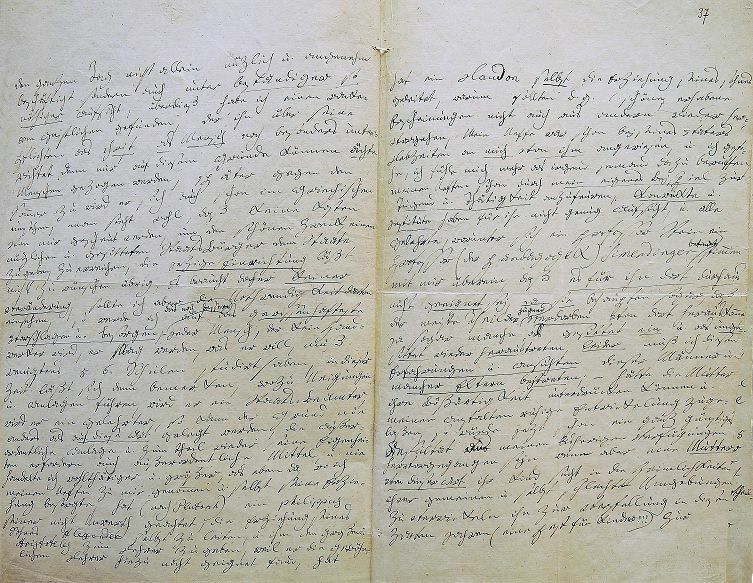 When Ludwig Nohl published this document in his 1865 edition of Beethoven's letters, he copied it from a document preserved in the estate of Anton Schindler in the Berlin Staatsbibliothek (D-Bsbha, aut. 35,17). Schindler's copy (which Thayer described as "the original") was not written by Beethoven and only bears the composer's autograph signature. The first publication of Beethoven's third will in Ludwig Nohl's Briefe Beethovens (Stuttgart 1865, p. 332) with the note "Nur die Unterschrift ist von Beethovens Hand". At some point before 1924, when the valuable holdings of the civil court of the Vienna Magistrate were fortunately moved from the archives of the regional court in Vienna's Palace of Justice to the City Archives in Vienna's city hall (most of the remaining material was to be destroyed in 1927), Beethoven's third will was stolen. It vanished without a trace and therefore Beethoven scholarship in the early 20th century never acknowledged its existence. Since the security precautions at the archives of the Vienna Justizpalast were not very strict – it was after all a frequently accessed facility of the court and not an official state archive – countless important documents related to prominent historical persons were stolen before they could be safeguarded by professional archival institutions. Mr. Johannes Othmar Müller, III., Löwengasse 7, apt. 6, today appears at the Vienna City Archive and hands over the following documents, originating from the holdings of the former civil court of the Vienna Magistrate, from the estate of his father Robert Müller, formerly residing at II., Alliertenstraße 3, apt. 8, who passed away in 1933. These documents, which once were housed in the registry of the Vienna Federal Court, were held by Mr. Robert Müller and after his death passed into the keeping of his widow Mrs. Leopoldine Müller who died on 14 August 1937. The files rightfully belong into the holdings of the Vienna City Archive, because in 1924 the archive took over the files of the civil court of the Vienna City Magistrate from the Landesgericht. 4.) A protocol dated 2 June 1786 concerning the counterfeiting case Oelsner-Count Pozdazky. Read and signed, Vienna 31 August 1937. The will of Ludwig van Beethoven listed under 1.) was added to the second will dated 23 March 1827, wills of the court of the Vienna Magistrate No. 158 ex 1827. The files listed under 2.) were placed into the probate records of Karl van Beethoven No. 1275 ex 1819. Beethoven's third will, i.e. 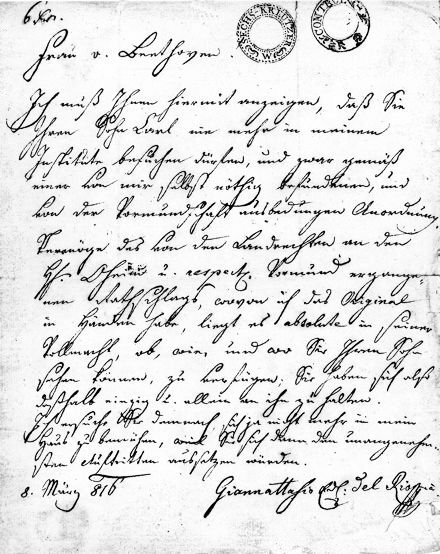 the letter he wrote to his lawyer Dr. Bach on 3 January 1827, which had been stolen before 1924 from the collection of wills held by the archive of the Vienna Landesgericht für Zivilrechtssachen. a) Beethoven's letter to the k.k. n. oe. Landrecht of 28 November 1815 (No. 857in the complete edition), in which he declares his will to take guardianship of his nephew according to his brother's last will. b) Beethoven's letter to the municipal Civil Court concerning his pedagogical theories regarding the education of his nephew Karl. This eleven-page letter, bearing the wrong year "1818" (it was actually written on 1 February 1819) consists of 2,169 words and is the longest existing letter in Beethoven's hand (No. 1286 in the complete edition). It was originally part of the Sperrs-Relation (probate file) of Beethoven's brother Karl which in 1815 had erroneously been drawn up by the k.k. Landrechte with the shelfmark Fasz. 5-174/1815 and in 1819 was transferred to the Magistratisches Zivilgericht (the civil court of the Vienna Magistrate) under the registry number Fasz. 2-1275/1819. This long letter was first published in 1902 by Alfred Christlieb Kalischer ("Ein ungedruckter Brief Beethovens", in: Die Musik, December 1902, 403-11) who had found a copy of this letter in Otto Jahn's Beethoven estate in the Royal Library in Berlin. 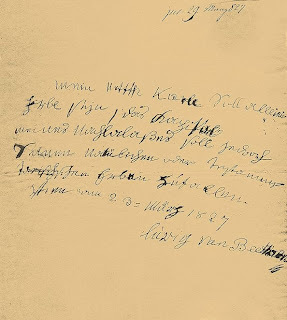 According to Kalischer, the first page of this copy bore the following note by Ludwig Ritter von Köchel: "Nach dem von Beethoven durchaus eigenhändig geschriebenen Originale bei dem Wiener Landesgericht" ("[copied] from Beethoven's completely autograph original at the Vienna Federal Court"). Therese Vogel was the mother of the poet Nikolaus Lenau. Her two submissions to the Federal Court may have been related to the investigation that the Austrian police had initiated against her son, because by publishing under his pseudonym he had repeatedly circumvented the strict censorship laws. The protocol concerning the "counterfeiting case Oelsner-Count Pozdazky" pertains to a legal cause célèbre of the Josephinian era. The "Hantz garden" was the Augarten, "Princess L____n" was Princess Eleonore von Liechtenstein (1745-1812), a recipient of one of the few farewell letters that Joseph II wrote in 1790 shortly before his death. Similar to the embezzler Johann Cetto von Cronstorff (1729-1786), who in 1782 had been Constanze Mozart's witness at her wedding, Podstatzky-Liechtenstein was sentenced to "public forced labor" which at that time meant sweeping the streets in Vienna. This typical Josephinian punishment somehow backfired when the Count, while working in the streets, saluted a highranking figure with his broom. The Emperor had enough and on 31 August 1786 had Podstatzky and his accomplice Elsner deported to Peterwardein and Semlin respectively, where they were forced to pull ships on the Danube. Since very few delinquents survived this gruesome labor for more than two years, Podstatzky-Liechtenstein's punishement amounted to a death sentence. On 10 January 1787 the slavonisch-banatisches Generalkommando reported the death of twenty arrestees, among them Podstatzky-Liechtenstein. Johann Elsner's death was reported on 20 October 1787. In his card catalogue pertaining to the entries in the court's cabinet protocols the historian Gustav Gugitz describes this case as "actually a judicial murder by Joseph II". It is not known where the documents related to Lenau and Podstatzky-Liechtenstein are today and if in 1937 the City Archive passed them on to their legal owner, the Allgemeines Verwaltungsarchiv department of the Austrian State Archives. According to a written statement, issued on 15 January 2014 by the responsible archivist Dr. Roman-Hans Gröger, "the registry of the holdings of the State Archive of Interior does not contain any reference to the searched donation". By stealing them Robert Franz Müller saved two valuable documents from the 1927 fire of the Palace of Justice, but after their return nobody could save them from the unfathomable labyrinths of Vienna's archives. B e e t h o v e n ' s will of 3 January 1927 came into the possession of the Vienna City Archive only on 31 August 1937. See the archive file with the number: 970/1937. This note is to be kept confidential! Robert Franz Müller was born on 26 June 1864 in Vienna's Leopoldstadt district (at Obere Donaustraße 41), fourth child of Eduard Bruno Müller, an official of the "K:K: Central-Hofbuchhaltung" (I. & R. central accounting department) and his wife Franziska Theresia, née Schenböck (the spelling "Schönbeck" that is found in many sources is incorrect). 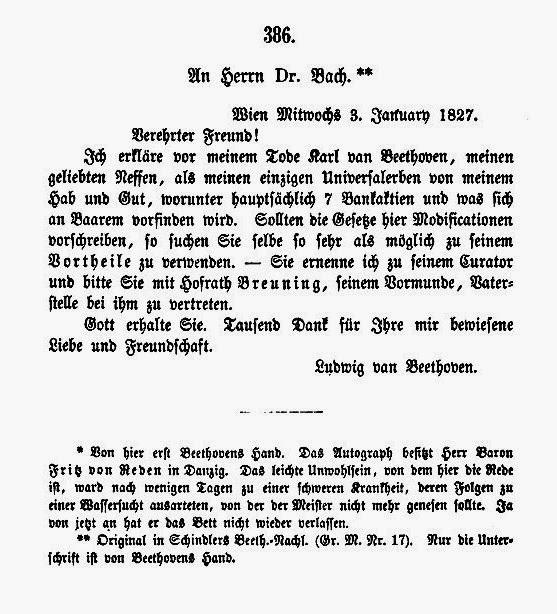 The entry concerning the baptism of Robert Franz Josef Serafin Müller on 3 July 1864 at the parish church of St. Leopold (Tom. 37, fol. 121). 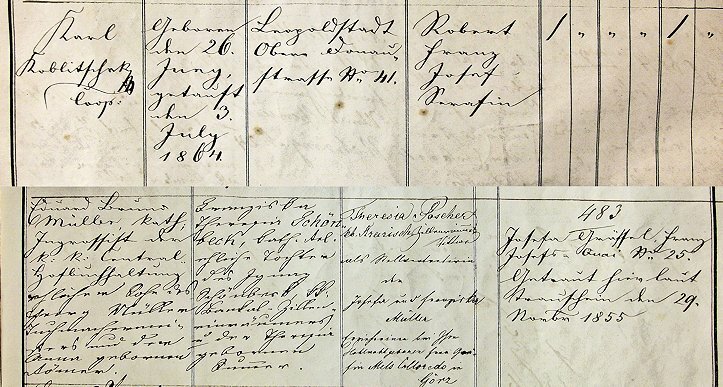 Müller's father Eduard Bruno Müller had been born on 4 October 1826 in Mährisch Trübau and had come to Vienna before 1851 where he is recorded as "Student" on a conscription sheet of the house Alsergrund 315. On 29 November 1855 Eduard Müller married Franziska Schenböck, born on 6 March 1831, daughter of the "K.K. Bankal-Zilleneinnehmer" (tax collector for flat-bottomed boats on the Danube) Ignatz Schenböck (b. 26 July 1800 in Engelhartszell, d. 6 November 1832 at Leopoldstadt 140) and his wife Theresia, née Summerer (b. 19 September 1805 in Erdberg, d. 24 September 1869). On 22 December 1869 Eduard Bruno Müller was appointed "K.K. Rechnungsoffizial" with the ministry of finance. Only one of his five children – Robert Franz – can be documented as having been still alive in 1890. Eduard Bruno Müller died of pneumonia on 29 January 1905 in his home at Nordbahnstraße 8. When in 1962 Leopold Nowak bought Robert Franz Müller's estate (A-Wn, F56 Müller) for the music collection of the Austrian National Library, Müller's son Johannes Othmar Müller provided a "Kurze biographische Skizze" ("short biographical sketch") concerning the life of his father (A-Wn, F56 Müller 1). 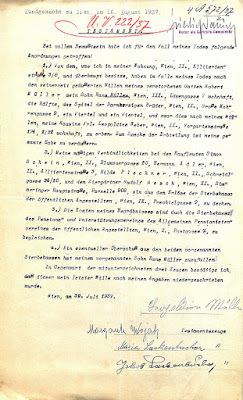 This document claims that Robert Franz Müller was related to the composer Wenzel Müller – a claim that could not be verified – and that his mother had been a sister of the DDSG captain Josef Poscher (b. 29 April 1839), a close friend of the conductor Hans Richter. Müller was very proud of his relationship to Josef Poscher, but as a matter of fact Poscher was not Franziska Schenböck's brother, but her half-brother and the original name of Josef Poscher's father was not really Poscher, but Fitzel. Der frühere Trost des Klavierspiels oder sogar des Patience–legens verfängt nicht mehr –– Nur der grosse Hund wird immer deutlicher, der mir auf's Grab sch––– wird. The place "where the big dog poops": Dr. Theodor Frimmel von Traisenau's grave in Vienna's Döbling Cemetery (8/4/8). The historian Arthur Schurig (1870-1929), who in 1927 was working on a (never to be published) Chronologie zu Beethovens Leben und Schaffen, also corresponded with Müller for whom he had nothing but praise, while he harshly criticised most of his colleagues: "The gaps in the so-called detail work of biographical material are enormous. Basically nothing has been done since Thayer. [...] Of course Frimmel just ruminates the old and well-known cabbage. And in what apothecary German! [...] The Beethoven-Year has produced absolutely nothing so far, because Orel, Frimmel, Nohl, and Kobald present nothing new." (Schurig to Müller on 19 February 1927, A-Wn, F56 Müller 18). From Müller's correspondence we know that he owned a significant and widely admired "Autographensammlung" (collection of autographs) and we have a hunch concerning the possible origin of this collection. 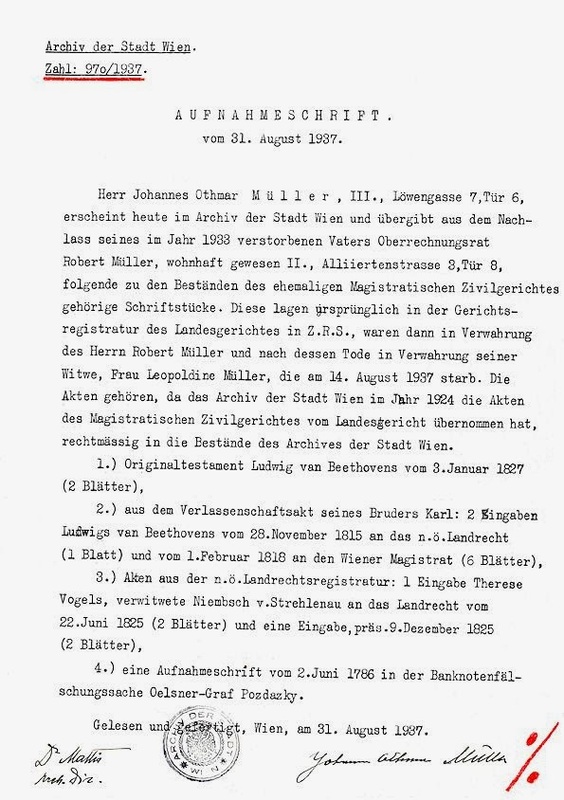 Müller might have arranged the fate of these documents and their distribution after his death in a detailed will, but he seems never to have considered this an important issue. A sudden death forestalled all possible provisions. On 15 February 1933, while waiting in line at the post office at Weintraubengasse 22, Müller suffered a massive stroke and died (as the newspapers put it) "within a few moments". Müller was survived by his wife Leopoldine (née Weber), living at Alliertenstraße 3/8 and his son Johannes, "39 J., Privatangestellter, Wien III, Löwengasse 7/6". Not surprisingly, the existence of the autograph collection does not appear in Müller's short probate document which under "assets" merely states "kein Nachlaß" (no estate). Right after her husband's death, Müller's widow may have sold off certain items from the autograph collection which would explain the fact that some documents from Karl van Beethoven's Sperrs-Relation were not returned in 1937 by Müller's son, but ended up in other places. As long as his mother was alive, Johannes Müller did not want, or was not allowed to return the Beethoven documents, because Leopoldine Müller obviously did not want to tarnish her own and her husband's reputation. Leopoldine Müller died on 14 August 1937. She left a will in which she possibly addressed the issue of the autographs, but this document is not accessible, because the particular box from the holdings of the Leopoldstadt district court could not be found in Vienna's Municipal and Provincial Archives. Only after his mother's death did Johannes Müller dare to come forward with the valuable Beethoven material and for doing that posterity owes him gratitude. It is not known what became of the main part of Robert Franz Müller's collection. Johannes Othmar Müller died childless on 18 August 1965, his widow Aloisa Maria Müller (b. 1894) died in May 1986. In 1965 the plaque on the stone of the family grave was replaced and now bears only Johannes Müller's name. Aloisia Müller was the last surviving family member. The grave fees were only paid for ten years and the right to use this burial site expired on 27 May 1996. Robert Franz Müller's work was generally excellent and far more meticulous than that of his contemporaries which – as we know only now – was related to the fact that he sometimes had the sources he used at home on his desk. It turns out that some stolen items that once were part of Müller's collection survive and their provenance can be traced. On 28 July 1828 Nicolò Paganini and his former mistress, the singer Antonia Bianchi reached an agreement in the civil court of the Vienna Magistrate regarding the custody of their illegitimate son Achille. For a compensation of 3,531 fl 2 x CM Bianchi gave her son into his father's guardianship to be raised and educated by Paganini, who, on his part, agreed to return to her all of her music that he had in his possession. On 8 March 1925 Robert Franz Müller published an article in the Neues Wiener Tagblatt, titled "Paganinis Sohn. Unbekanntes aus alten Wiener Akten" ("Paganini's son. Unknown information from old Viennese files") in which he not only referred to Achille Paganini's (now lost) baptismal certificate from the church of San Bartolomeo in Palermo, but also quoted extensively from the contract between Paganini and Achille's mother Antonia Bianchi. Müller's article was based on one single file from the "Faszikel 3" series of the civil court of the Vienna City Magistrate, which, among other issues, covers custody cases. This file (bearing the original shelfmark Mag. ZG, Fasz. 3 - 688/1828) is now missing from the holdings of the Vienna City Archive. 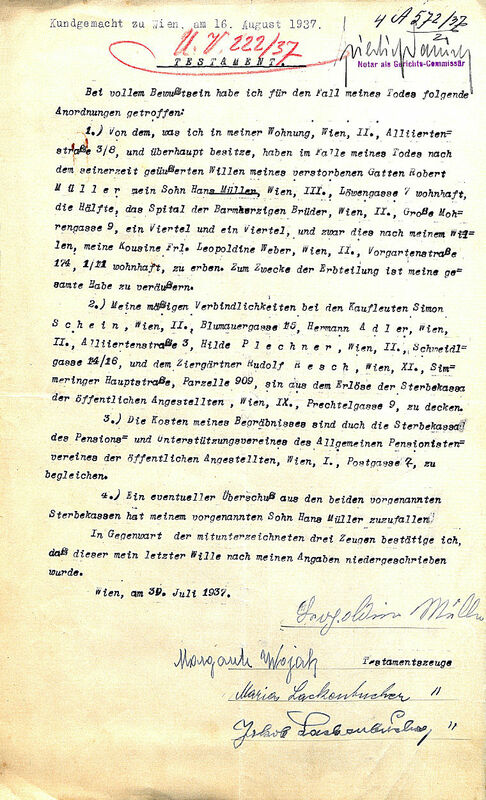 Müller must have stolen the Paganini file from the archive of the Vienna Federal Court before 1924, because parts of this document are now held by the archive of the Gesellschaft der Musikfreunde. At some point the file must have been taken apart, because two leaves only survive in the form of fragments that bear Paganini's autograph signature. The remains of this highly fascinating court file seem to have gone through the hands of a ruthless collector who seems to have cared very little about the historical context of this unique document. The Gesellschaft is obviously totally unaware of the document's shady origin, because in 2011 a part of it was shown at the exhibition "Auf den Flügeln des Applauses Virtuosenkunst – Virtuosenkult". On 10 January 1926 the Neues Wiener Journal published Müller's article "Die Heirat des alten Strauß" in which Müller dealt with Johann Strauss, the Elder's wedding. It is not clear on which sources Müller based his article, but since he quoted a document that normally is not part of an "Ehekonsens" (marital consent) file of the civil court, it is obvious that Müller stole both of the existing sources: the "Ehekonsens" from the archive of the Vienna Federal Court and Strauss's "Verkündakt" (the documents submitted for the banns) from the holdings of the Lichtental parish archive. When in April 1825 Johann Strauss's girlfriend Anna Streim realized that she was pregnant, the couple was a little pressed for time to get married. Since Strauss was still a minor (the age of legal majority was 24 back then), his guardian, the tailor Anton Müller, had to apply to the Vienna municipal court for his ward to be allowed to get married. The bride, who, born in August 1801, also was still a minor, got the permission from her father. On 5 April 1825 Anton Müller submitted the application, which referred to an upcoming tour of the groom (urgent travel plans, or the telling term periculum in mora, were a popular excuse for quick wedding preparations), curiously gave a wrong date of birth of the bride and pointed out the fact that, based on his income as music teacher and his concerts with the brothers Scholl, Strauss was able to earn 400 gulden per year. In addition to that, the bride was able to make money with her needlework and had a secure shelter at her parents' home during the absence of her future husband. Because Strauss was unable to attend the first hearing, scheduled for 13 May, the court extended the deadline and granted the permission on 24 June 1825. The wedding took place on 11 July 1825 in the Lichtental Church, the couple's first child was born on 25 October of that year. The documents that were deposited at the parish are missing from the series there. They were stolen by an unscrupulous collector, as he practiced it at many other places in archives. Thus we even have to be grateful to him that he published at least some documentary texts in the daily press. It is rather likely that Robert Franz Müller also stole the file concerning Strauss's marital consent (A-Wsa, Mag. ZG, A3, 664/1825) from the holdings of Vienna Federal Court. Needless to say that – like the Paganini file – it is missing today from the A3 series of the civil court files. 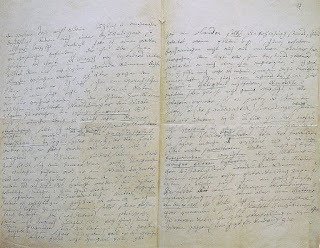 A document from Karl van Beethoven's probate documents, stolen by Robert Franz Müller before 1924, which Müller's relatives were obviously unable to sell, ended up in Müller's estate in the Austrian National Library (A-Wn, F56 Müller 93). It is a letter by Cajetan Giannattasio del Rio (1764-1828), the owner of the boarding school that Beethoven's nephew Karl attended, to Beethoven's sister-in-law Johanna who had fought with the composer in court over her son's guardianship. That the letter once belonged to the file of the civil court is proved by the imprinted six kreuzer revenue and the control stamp on top of it. Del Rio was ordered by the court to write this letter and he submitted a copy of the document as evidence. I have to notify you herewith that you will never again be allowed to visit your son in my institution, and that is because of an order which I myself considered necessary and which was stipulated by the guardian. On the basis of the resolution issued by the Landrechte court to the uncle and guardian respectively, of which I hold the original in my hands, it is absolutely within his authority to decide, whether, how and where you can see your son. Regarding this issue you must consult only with him. I request you therefore not to come into my house again, because you would be faced with the most unpleasant scenes. 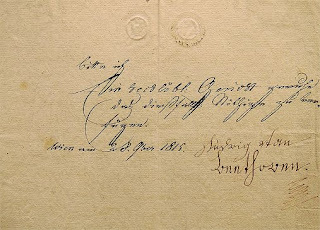 Giannattasio del Rio's letter to Johanna van Beethoven from 6 March 1816, a document stolen by Robert Franz Müller from Karl van Beethoven's probate documents (Magistratisches Zivilgericht, Fasz. 2-1275/1819) in the Archives of the Vienna Federal Court. (A-Wn, F56 Müller 93). This letter was published as No. 915 in the complete edition of Beethoven's letters, but the editors did not address the document's provenance. Beethoven's request to the Landrechte of 15 February 1816, which today is held by the Beethoven-Haus and which also originates from Karl van Beethoven's probate file, also bears the distinct smell of Robert Franz Müller's larcenous activities. Beethoven's letter of 29 March 1818 to his sister-in-law (No. 1251), which today is held by the Yale University Library (73.B 393), was also at some point of time stolen from Karl van Beethoven's probate file which is proved by its bearing the shelf marks of both Viennese courts. There are countless other Beethoven documents whose provenance can be traced to Vienna's Landesgerichtsarchiv. Of course none of the collections and libraries addresses the thefts. These institutions all behave as if, at some time, court-related Beethoven documents had begun to magically materialize in the desks of private citizens who were generous enough to donate them to the Beethoven-Haus in Bonn. A second historical document in Müller's estate in the ONB, which must once have been part of his autograph collection, is a letter by the military officer Karl von Valmagini, dated Bucharest, September 27th, 1790, to his aunt in Vienna (A-Wn, F56 Müller 94). Valmagini's aunt was nobody else than Maria Anna von Gluck, the widow of Christoph Willibald Ritter von Gluck. On 22 December 1740, Valmagini's father, the Milan Mauro Ignazio von Valmagini, had married Maria Josepha Bergin, Gluck's future sister-in-law. In 1790 Karl von Valmagini took part in the Austro-Turkish War and the request he had from his wealthy aunt was a simple and obvious one: he asked her if she would be so kind as to lend him an amount of 500 to 1,000 ducats. How Valmagini's letter came into Müller's possession is not known. The document is an interesting Gluck family item, but its financial value is neglible. 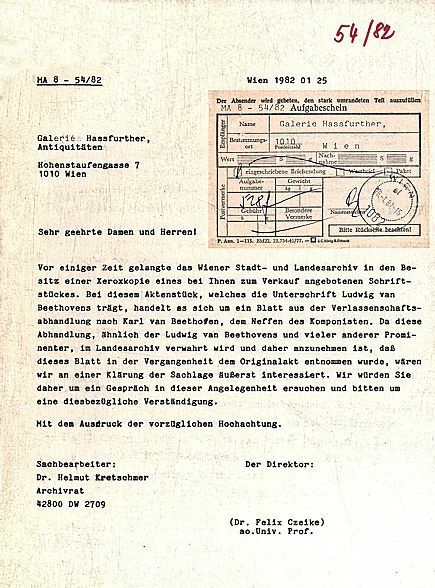 In January 1982 the Viennese auction house Hassfurther offered a Beethoven document for sale at a price of 50,000 Schillings (then about $5,070). It was a two-leaf sheet of paper with one and a half pages of handwritten text bearing the composer's autograph signature. The document's text consists of a protocol of a meeting which took place on 29 March 1820 at the civil court of the Vienna Magistrate in the presence of the following people who discussed issues regarding the custody of Beethoven's nephew: the Vienna City councilors Franz Xaver Piuk, Aloys Beranek and Anton Bayer; the court recorder Leopold Staudinger, Ludwig van Beethoven and the writer Joseph Carl Bernard. 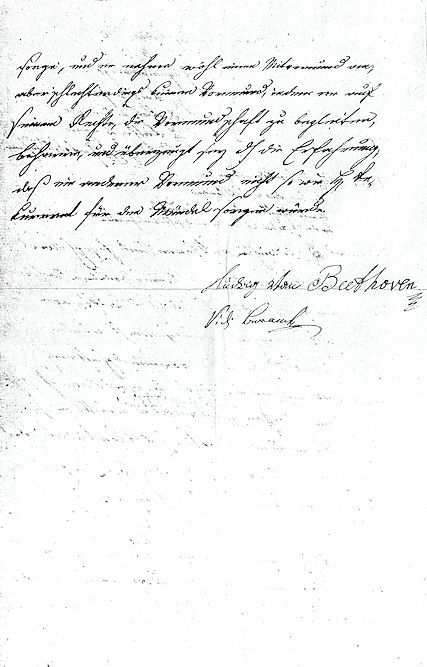 According to the protocol, Beethoven stated that "first, he persists to request the guardianship [of his nephew] in accordance with his brother's will and the law, second, that he proposes Herr von Peters, Court councilor of Count Lobkowitz as co-guardian, third, he requests that Johanna van Beethoven be excluded from the guardianship like it was decreed earlier by the Landrechte court; and, fourth, referring to the statements he already made earlier to the civil senate, that he is fully taking care of his nephew and that he accepts a co-guardian, but certainly not a guardian, because he persists on his right of guardianship and that based on his experience he is sure that no other guardian is able to take care of the ward the way he can". The second page of an 1820 protocol of the municipal civil court, bearing Beethoven's signature, which was sold by Hassfurther in 1982: "[...] sorge, und er nehme wohl einen Mitvormund an, aber schlechterdings keinen Vormund, indem er auf seinem Rechte, die Vormundschaft zu begleiten[sic! ], beharre, und überzeugt sey d[urc]h die Erfahrung, daß ein anderer Vormund nicht so wie H[err] Rekurrent für den Mündel sorgen würde. Ludwig van Beethoven. Vidi Beranek". some time ago the Municipal and Provincial Archives of Vienna came into the possession of a xerox of a document that you are offering for sale. 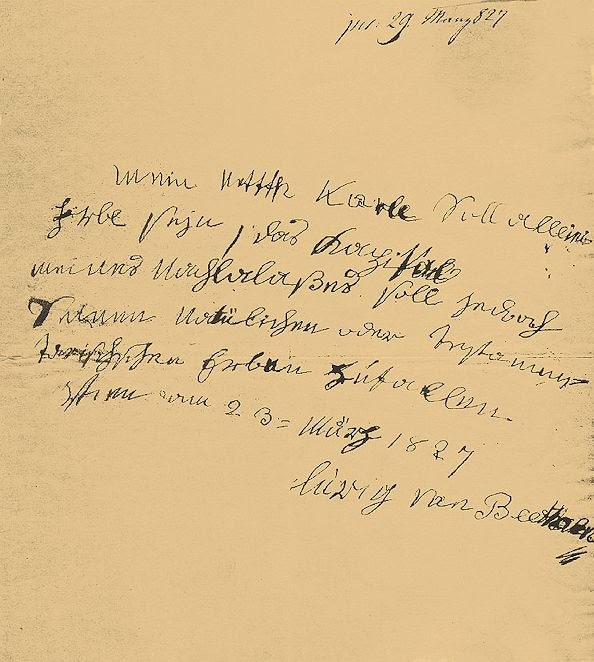 The document in question, which bears Ludwig van Beethoven's signature, is a sheet from the probate records of Karl van Beethoven, the composer's nephew[sic]. Because these probate records – like Beethoven's and those many other prominent people – are held by the Provincial Archives and because it can be presumed that the document has been removed in the past from the original file, we would very be very interested in clarifying the situation. Therefore we would like to ask you for a talk concerning this matter and would be grateful for an appointment. Felix Czeike's letter to the auction house Hassfurther (A-Wsa, M.Abt. 438, A1, 54/1982). The file concerning the Hassfurther incident of 1982 has only become accessible to the public in 2012. On 31 March I visited the Gallerie Hassfurther to conduct a conversation concerning a document that bears the original signature of Ludwig van Beethoven. This document, which has been offered for sale by the above gallery, originates from the probate records of Karl van Beethoven. [...] Our former colleague Dr. Hans Jäger-Sunstenau pointed the attention of the archive to the aforesaid document which is being sold by Hassfurther. After the archive had asked for an appointment weeks ago without getting any reaction, a personal visit to the gallery seemed necessary. When I requested information concerning this matter, I was told in a harsh and dismissive manner by the head of the gallery that the archive had absolutely no right to request information, even less to make a claim on the document proper. He told me that the sheet in question had already been taken from the holdings of the court between 1850 and 1870 and that the gallery had received this information from an unnamed scholar. Apart from that, the gallery refuses to provide any further information and all future conversations have to be conducted with the Viennese lawyer Dr. Rudolf Bazil. Of course the City Archive had no chance to get back the stolen document. On 7 April 1982 Czeike informed the Senatsrat at the Magistratsdirektion Dr. Richard Sehnal, the (then) city councilman Dr. Helmut Zilk and the general director of the Austrian office for archives Dr. Rudolf Neck. On 14 April 1982 the archive submitted a long and detailed report concerning the matter to the police administration (Z. II.-29.160 – SB/82), expressing gravest concern that "a stolen document might be sold to an anonymous occasional customer and thus be lost forever to the archive." 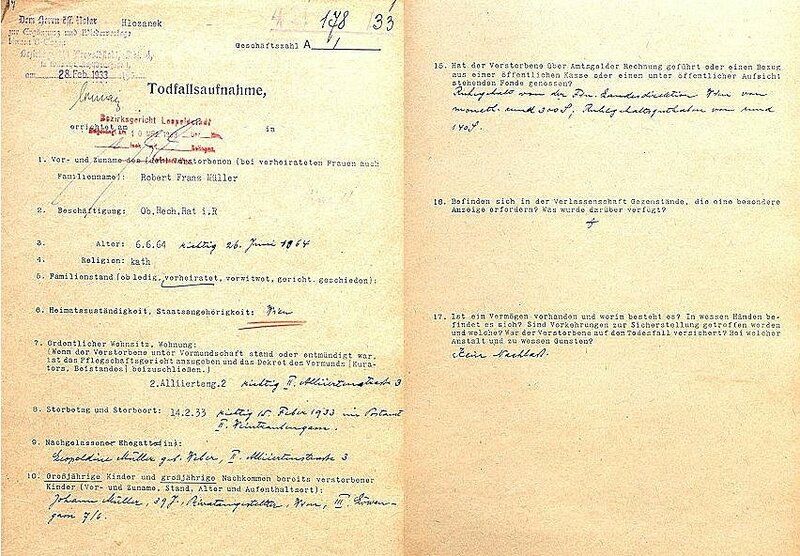 A complaint with the public prosecutor (8 St. 26.448/82) was filed against Hassfurther and the writer Dr. Fritz Habeck (who seems to have been the original seller of the document). Owing to the lack of evidence the City archive had no legal case against Hassfurther and all legal action by the attorney of state was shelved on 25 May 1982. Hassfurther agreed to at least provide the archive with photographs of the document. The original protocol from 1820 was sold (at a much too high price) to an anonymous German buyer. When Dr. Kretschmer put the photographs of the document into Karl van Beethoven's "Persönlichkeitenakt", in a fit of desperate optimism, he also put a note into the file, reading: "Currently[!] in German private property (1992)". 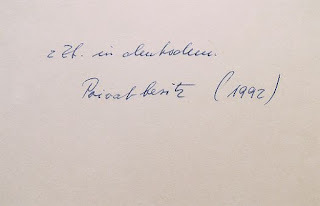 Dr. Kretschmer's wishful note in Karl van Beethoven's probate records: "z Zt. in deutschem Privatbesitz (1992)"
The missing leaf in the death register with Beethoven's name has been replaced with a typescript copy of the death notices in the Wiener Zeitung of 30 March 1827. We find ourselves wondering how Mozart's and Schubert's entries in Vienna's death registers ever could survive into the 21st century. 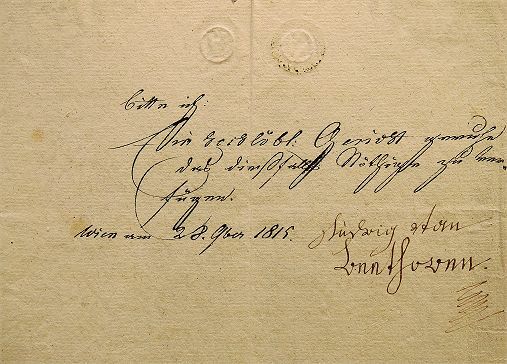 Until 1924, Beethoven documents in the archives of the Vienna Federal Court were plundered ruthlessly and we can safely state that every document in the collection of the Beethoven-Haus that bears an Austrian imprinted revenue stamp once belonged to these archives. Unfortunately the losses of valuable material have not ceased: in 1969 Hanns Jäger-Sunstenau numbered the sheets of the Beethoven file in the Vienna City Archive with a ballpen, but in 1999 I discovered that nine leaves of that file had already been stolen. Owing to the lack of a reliable inventory (Jäger-Sunstenau's documentation from 1970 is very fragmentary), the archive could not even figure out what exactly had gone missing. When in 1999 I informed the (meanwhile retired) head of the archive of the loss, he bluntly replied: "We have so many files of prominent people!" © Dr. Michael Lorenz 2014. All rights reserved. 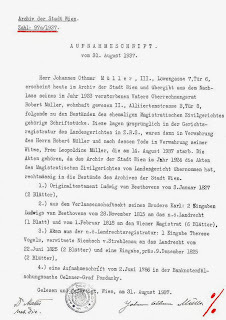 In the course of a systematic examination of the wills in the holdings of a Viennese district court from between 1890 and 1939, I was recently able to locate the will of Robert Franz Müller's mother Leopoldine which in 2014 could not be found in the holdings of Vienna's Municipal and Provincial Archives. It was lost because the box containing the wills of the Leopoldstadt district court from 1937 had been falsely labelled as belonging to the Bezirksgericht Innere Stadt (Serie 2.3.1.1a.A9 instead of Serie 2.3.1.2a.A9). As far as her son's mysterious autograph collection is concerned, Leopoldine Müller's will does not offer any new information. In accordance with her late husband's requests, she bequeathed all her assets to be sold and the profit to be divided into three shares: half of it should go to her son Hans Müller, and each of the remainng two quarters to the hospital of the Barmherzige Brüder in the Leopoldstadt, and to Leopoldine Müller's cousin Leopoldine Weber. The second paragraph addresses Frau Müller's four creditors whose demands are supposed to be covered by the life insurance of civil servants. An eventual surplus from this insurance was supposed to go to Hans Müller. The will was written on 30 July 1937. The three witnesses, Margarete Wojak, and the police officer Jakob Lackenbucher and his wife were neighbours of Frau Müller at the house Alliiertenstraße 3 (Adolph Lehmann's allgemeiner Wohnungs-Anzeiger 1937, vol. I, p. 712 and 1472). 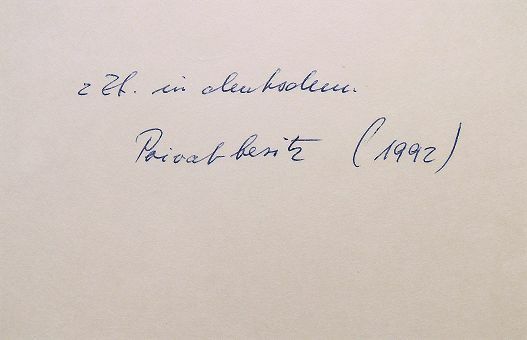 It seems that Robert Franz Müller's autograph collection was either silently passed into the ownership of his son already in 1933, or – with the exception of the four abovementioned documents– it was sold in 1937. Excellent work, and very entertaining. Many thanks for your scrupulous investigations!